① Cut the deep-fried tofu in half lengthwise and then open up each half to make a pocket. ② Diagonally cut the green onion (thinly). Remove the stem and seeds from the bell pepper and cut thinly across its length. 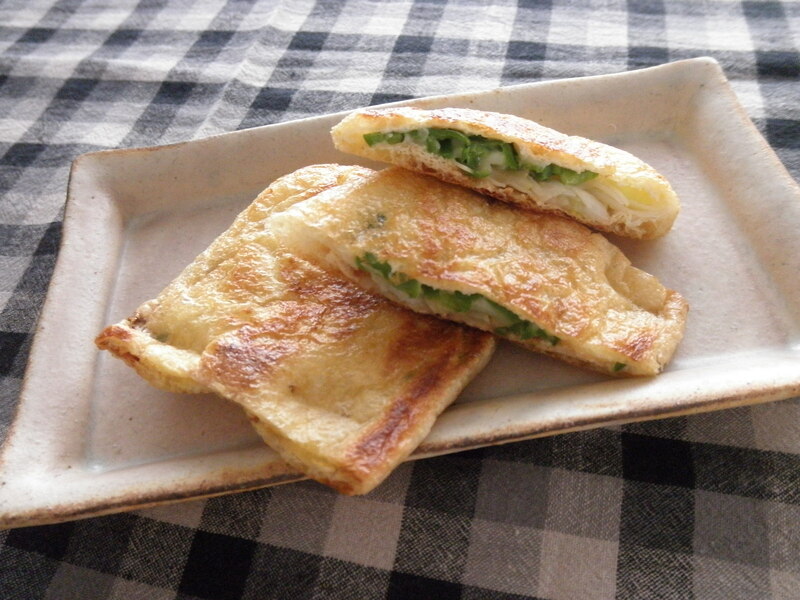 ③ Open the deep-fried tofu pockets and spread miso on one of the inside walls. Spread the green onion, bell pepper, and cheese evenly inside each pocket. Use a toothpick to close each pocket and prevent the contents from coming out. This should be done as if sewing the pocket shut. ④ Heat a frying pan. Fry each pocket until brown on both sides and you can smell the aroma of the contents.